The antimicrobial activity of silver has been demonstrated in vitro, including multi-resistant bacteria such as MRSA. 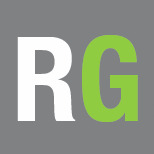 To be bactericidal, silver has to turn into silver ion (Ag+). Wound exudate favours this transformation, either by loss of an electron if silver was in its elemental form, or by separation of the compound to which the silver ion was attached. Silver ions are very reactive and produce bacterial destruction by their action in different targets: they break down the bacterial wall, interfere with protein production and cell replication. Different studies in experimental models suggest a reduction of bacterial adherence and destabilization of the biofilm matrix (See figure). 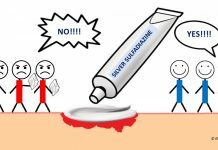 One well-designed clinical trial and two Cochrane reviews conclude that the use of silver dressings may not improve the healing process,1-3 which contrasts with the results of other studies, expert opinions and the observations in our clinical practice. These results may be due to inappropriate use of silver dressings, in wounds without signs of infection or for long periods of time. I would like to highlight a review published in the journal of the American Academy of Dermatology4 that supports the beneficial effect of silver in decreasing wound size, without being able to determine its role in long-term healing rates. As an inorganic compound: silver oxide, silver phosphate, silver chloride, silver sulfate, silver sulfadiazine. As an organic compound: silver alginate, ionic silver-impregnated sodium carboxymethylcellulose. Different dressings have variable amounts of silver and, when comparing their in vitro antibacterial efficacy, no correlation has been found between the content or amount of silver released and their antimicrobial activity. Therapeutic indication, in ulcers with excessive bacterial load or signs of infection. Prophylactic indication, in wounds at risk of infection. If the wound has improved, but signs of infection persist, the silver dressing would be continued. If there is no clinical improvement, its use should be discontinued. If the evolution is good and there are no clinical signs of infection, it should also be discontinued. The risk of systemic toxicity from prolonged use of silver dressings has been suggested. Generalized argyria is due to the deposition of silver-containing particles in different organs. The systemic toxicity of silver is very low, and its effects are limited to cutaneous-mucosal hyperpigmentation. The minimum amount of silver needed to produce it is not known, but it appears that it could be triggered with oral doses greater than 3.8 g of elemental silver. 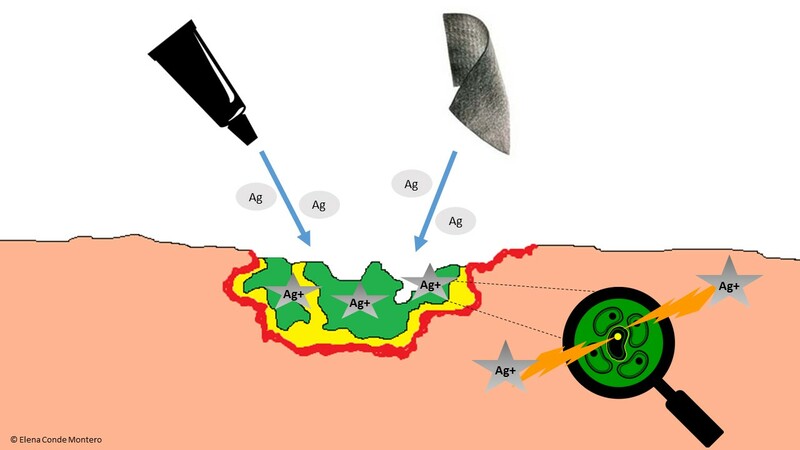 The amount of silver systemically absorbed in its use in wounds is minimal.6 Although a local greyish pigmentation can be produced by silver deposit, it should not be confused with a generalized argyria. 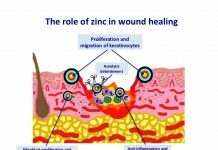 If you want to know more about silver in wound healing: Appropriate use of silver dressings in wounds: international consensus document. This is a consensus document following a meeting of experts in 2011 to formulate internationally recognised guidelines on the appropriate use of silver dressings, based on clinical practice experience and available evidence. Michaels JA, Campbell B, King B, et al. Randomized controlled trial and cost-effectiveness analysis of silver-donating antimicrobial dressings for venous leg ulcers (VULCAN trial). Br J Surg 2009; 96(10): 1147-56. Vermeulen H, van Hattem JM, Storm-Versloot MN, Ubbink DT. Topical silver for treating infected wounds. Cochrane Database Syst Rev 2007; 24(1): CD005486. Storm-Versloot MN, Vos CG, Ubbink DT, Vermeulen H. Topical silver for preventing wound infection. Cochrane Database Syst Rev 2010; 17(3): CD006478. Carter MJ, Tingley Kelley K, Warriner RA. Silver treatments and silver impregnated dressings for the healing of leg wounds and ulcers: A systematic review and meta-analysis. J Am Acad Dermatol 2010; 63: 668-79. Consenso Internacional. Uso adecuado de los apósitos de plata en las heridas. Consenso del grupo de trabajo de expertos. London: Wounds International, 2012. M C Fariña, P Escalonilla, R Grilli, M L Soriano, L Martín, L Requena, J L Sarasa, A de Castro. Argiria generalizada secundaria a la administración tópica de nitrato de plata. Actas Dermosifiliogr. 1998;89:547-52.